In lieu of paying a bazillion dollars for professional photographs of my belly...we did just buy a car you know...I decided to set up the tripod and give it a go myself. I actually don't think they turned out that bad. I mean, clearly there is a blatant over use of Photoshopping here...but considering the cost...I'm pretty satisfied. For self-portrait shots, they look great! 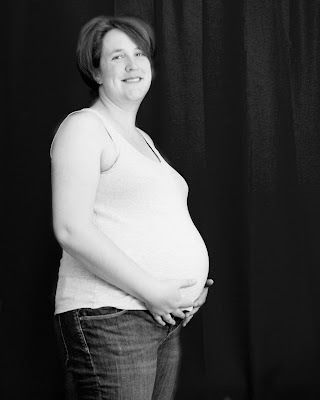 Obviously if you have a huge abundance of money to spend there is no substitute for professional pictures, but as someone who would never, say, display a giant picture of my pregnant belly on my wall... saving the $$ and taking them yourself (when they turn out so well) is a super idea. They came out great! You look beautiful. I'm impressed! Self portraits are really, really tough for me, and I admire anyone who does them well. The last shot is my favorite. Gorgeous! They came out amazing!!! You look great! My favorite shot is the last one: amazing.